HONG KONG, May 27, 2018 (BSS/AFP) - More than two thousand volunteers hit the beach on an outlying island of Hong Kong for a mass rubbish clean up Sunday as environment campaigners warned plastic is killing sea turtles and other wildlife. There has been increasing concern over the amount of rubbish in Hong Kong waters which washes up on its numerous beaches. Authorities and environmentalists have pointed the finger at southern mainland China as the source. Last year, a massive palm oil spillage from a ship collision in mainland Chinese waters clogged Hong Kong beaches. But there is evidence that Hong Kong is also to blame. In 2016, local media reported that syringes and medical waste washed ashore from clinics in the city. Sunday's clean-up took place on Shek Pai Wan, near Sham Wan -- known as "Turtle Cove" - on Hong Kong's Lamma Island. Sham Wan is one of the few regular sea turtle nesting grounds in southern China and is closed to visitors from June to the end of October, but campaigners said no nests have been recorded in the area in the past six years. "Turtles aren't making it to the beach to lay eggs," said Aquameridian campaigner Sharon Kwok, adding that turtles are dying, ending up tangled in nets, hit by high-speed boats and ships, and most often, because of trash ingestion. "Turtles are mistaking plastic bags for jellyfish and eating them," said Kwok, explaining they are incapable of throwing them up as they have barbs in their mouths. Volunteers gathered dozens of bags of trash including drinking straws, forks and spoons, polystyrene, toothbrushes and plastic bags on the sandy beach. With much of the plastic waste broken into small pieces, participants needed to use sifters to pick them out. "From a far distance it looks like it is just normal stones and pebbles, but if you look closer, there's actually quite a lot of small plastics, and turtles can easily think that is food," said 14-year-old volunteer Tommy Tsui. 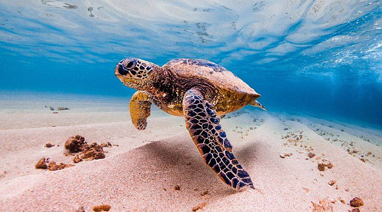 This year seven green turtles have already washed ashore in Hong Kong according to Kwok, but environmentalists believe more have died and their carcasses have sunk. Campaigners are urging the government to expand the "restricted area" around Sham Wan, extending it beyond the dry-sand beach which is already protected to the rocky shoreline as well as the shallow waters of the bay. "I hope that they can expand the restricted area further along the sea and the survival rate of turtles will be higher," said 13-year-old volunteer Caitlin Chiu.